I know that most people who read this blog don't know or care about motorcycle sports, but Ken and I are both big fans, and we watch both GP and Superbike races when they are televised. 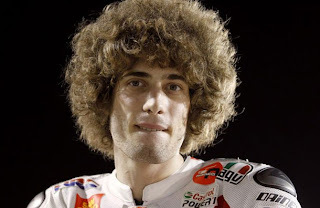 Tonight we were shocked to witness live on tv the accident which resulted in the death of one of the top riders in MotoGP racing - 24 year old Italian Marco Simoncelli. Marco was flamboyant on and off the track. When someone dies, everyone always says they loved life. But he had a very vibrant personality. He already had a huge fanbase around the world, partly down to aggressive riding - but also because he was just a cool guy. He didn't take himself too seriously and would have been a big star for next year. Casey Stoner. Waste of a young life and I think an Englishman was also killed in a car race. Racing seems to be so dangerous. I liked your owl face - well done in the next post. I am glad I posted the Asylum seeker story and there was some truth in it. I agree the warm weather does help cheer us up and feel brighter. Then it gets cool again, but we didn't get the rain you had.